Long before Francis Fukuyama published his famous article by the end of last century, an Arab thinker coined the term "End of History" in a different context. As it was in Arabic, it did not attract a lot of attention and the author was not much credited. That was one of the early books of Dr Abdul Wahab Al Messiri, who died in Cairo on the 3rd of July 2008, aged 70. In the book, End of History: An Introduction to Structural Study of Zionist Thought, published in 1972, Al Messiri suggested that the notion of "end of history" is a sort of Western hegemonic theory imposed on the world. An outstanding professor of English literature, Al Messiri was predominantly known for his Encyclopedia on Jews, Judaism, and Zionism. Though some dogmatic propagandists accused him of anti-Semitism, Al Messiri was the most enthusiastic proponent of Semitism, yet staunchly against Zionism as a fascist outcome of Western imperialism. In the Encyclopedia, which took 25 years of hard and continuous work, Al Messiri establishes the difference between Jews, their religion, and Zionism. He refutes the misleading demagoguery linking Zionism to Judaism, and in all his other writings he was for the peaceful co-existence of Jews, Christians and Muslims in the region. But he was always clear about the nature of the Zionist entity in occupied Palestine, created as a spearhead for Western powers to keep the region under their influence for good. In his last year, while suffering from cancer, he led the opposition movement Kefaya (Enough) calling for political reform in Egypt. That was part of the spirit of that great thinker - determination and leading by example. Besides the Encyclopedia, Al Messiri wrote tens of books, hundreds of articles, and gave as much lectures on wide range of subjects. He was a model of the comprehensive intellectual, though the main contribution was his unrivalled, in-depth analysis of Zionism and its relevance to the Arab-Israeli struggle. 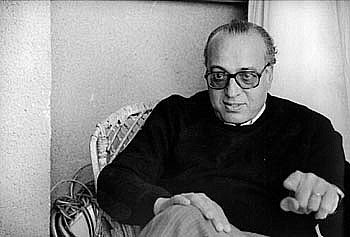 Al Messiri spent years in the US early in the second half of last century, where he completed his post-graduate studies and worked on the early seeds of his literary project. His exposure to Western culture enriched his experience, without deforming his genuine intellectual foundations. The most important example, for the wider public aside from his academic colleagues and apprentices, Al Messiri will be remembered with is being genuine, consistent and principled. Devotion and dedication to a cause were the mantra of the time, and he kept inspiring those who worked with him by the same principles. He was one of the knights of a generation of great people that included economist Dr Ramzi Zaki, and politician and writer Adel Hussain, who left our world before him. There remains a few of this brand such as the socio-economist Galal Ameen and writer Mohammad Hasanin Heikal. One of the things not that well-known is Al Messiri's contribution to the renewal of Islamic thought, in a more rational yet fundamentalist way. Like many of his generation, he started as a Marxist. Then, like many others also, he moved closer to political Islam - without sacrificing the critical mentality and the scientific way of thinking. I knew Al Messiri through his books before I met him two decades ago. Since then we met in Egypt and abroad, and every time I got that impression of a man who lives what he thinks and says - without any pretence or hypocrisy. Personal integrity, like intellectual genuine consistency, was a common feature among that generation of pioneers. I did not work closely with him in academia, nor was one of his students, but I learnt a lot from him. One precious thing about the great Arab thinker we lost is the humility of a great scholar mixed with the marvellous dignity of Sufism. Besides his philosophical work, he was a great literary critic, a poet and novelist. I remember one of his recent analysis a few years ago was a comparison between Lebanese singer Nancy Ajram and her Egyptian colleague Ruby, and how he concluded that Nancy is more real than Ruby. His solid belief that Palestine will one day be for the Palestinians was never shaken, and it was no coincidence that he spent his last week of his life in Palestine Hospital in Heliopolis, where he died. Al Messiri will live, not only through his literary creativity but also through the example he was living all the time. *The writer kindly agreed to republish this article on Arabdemocracy to commemorate 40 days since Al Messiri's death. "As it was in Arabic, it did not attract a lot of attention and the author was not much credited."